Last week’s economic news included multiple reports on housing and the labor sector. The good news is that job markets appear to be stronger, with new jobless claims and the national unemployment rate lower. Unfortunately, housing continues to struggle in its recovery. Pending home sales slumped in August and the S&P Case-Shiller Housing Market Index reports for July showed slower growth in home prices with 19 of 20 cities posting lower gains than for June. Mortgage rates were mixed, but remained relatively steady. The National Association of REALTORS® released data for August that showed that pending home sales dropped by 1.10 percent to a reading of 104.7 as compared to July’s reading of 105.8. Pending home sales indicate upcoming closings and mortgage loan volume. Pending home sales fell by 2.20 percent year-over-year. Analysts attributed the drop in pending sales to lower investor participation. Analysts said that as distressed home sales diminish, mortgage rates and home prices rise, investors are not buying as many homes Regional results showed fewer pending sales in all regions except the West, where pending sales rose by 2.60 percent in August. A reading of 100 in the pending home sales index is consistent with 2001’s average contract level. S&P Case-Shiller Housing Market Index reports indicated that July home prices gained 6.70 percent year-over-year as compared to June’s year-over-year reading of 8.10 percent. Prices even dropped in San Francisco to its lowest reading since 2012. On a seasonally adjusted basis, July home sales fell by 0.50 percent in July as compared to June’s decrease of 0.30 percent. 19 of 20 cities showed lower rates of price growth in July. Slower growth of home prices was viewed by analysts as potentially increasing demand for homes provided that mortgage rates stay low. Construction spending for August fell by 0.8 percent on a seasonally adjusted basis. The good news here is that spending on residential construction dropped only 0.10 percent. According to Freddie Mac’s PMMS report, average mortgage rates were a mixed bag. The average rate for a 30-year fixed rate mortgage dropped by one basis point to 4.19 percent with discount points lower at 0.40 percent. The average rate for a 15-year fixed rate mortgage held steady at 3.36 percent with discount points unchanged at 0.50 percent. The rate for a 5/1 adjustable rate mortgage fell by two basis points to 3.06 percent; discount points rose from 0.40 percent to 0.40 percent. Lower mortgage rates are seen as a potential stimulus for housing markets as more buyers may be encouraged to enter the market. Job markets are showing signs of improvement according to data on weekly jobless claims and reports released by the Department of Commerce. Weekly jobless claims grew by 287,000 as compared to expectations of 298,000 new claims filed. The prior week’s reading was also higher at 295,000 new claims filed. The Department of Commerce released its Non-farm Payrolls report for August with more good news. 248,000 jobs were added against expectations of 220,000 new jobs and 180,000 new jobs reported in the prior week. The national unemployment fell below the six percent benchmark in August with a reading of 5.90 percent, which indicates proof that the jobs market is improving. September’s Consumer Confidence Index suggests that economic conditions continue to concern consumers. The reading for September was 86.0 against an expected reading of 92.3 and Augusts reading of 93.4. 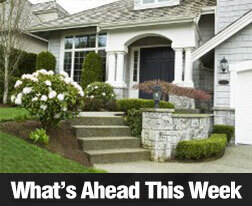 There is no scheduled housing news for next week other than Freddie Mac’s weekly report on mortgage rates. Other economic news includes Labor Market Conditions Index, Job Openings, and the release of minutes from the last FOMC meeting, which is expected to reaffirm the Fed’s position that it doesn’t expect to increase the target federal funds rate for a “considerable time” after the Fed concludes its asset purchases this year. This entry was posted in Housing Analysis, Mortgage Rates, Mortgage Tips and tagged Case Shiller/ HPI, Financial Reports, Housing Market, Mortgage Rates. Bookmark the permalink.